HandBrake Always "Selects the Wrong DVD Title" - How to Make it Right? "I always use HandBrake to rip my DVDs free. However, some DVDs use lots of bogus titles (with duration close to, and often exceeding that of the main title) as a copy protection measure. This causes HandBrake to select the wrong DVD title, and the result is a movie where the chapters are out of order which is kind of unpleasant to watch." Why Can't HandBrake Choose Correct Title? How to Solve? Then, check whether the DVD has 99 titles, which in most cases, is protected by Disney. If so, just make sure your HandBrake version is later than 0.9.4 (which has fixed it), and you have properly installed VLC. Please note that 32-bit HandBrake only works with 32-bit VLC, and 64-bit HandBrake only works with 64-bit VLC. You may try specific title scan or alternatively open the file or folder source on VLC to play and find which one is the main DVD movie title, and then you can choose this title manually. WinX DVD Ripper Platinum: Windows (10) version HandBrake alternative to rip ANY copy protected DVD to all mainstream videos, and enable convert DVD to Galaxy Note Edge, DVD to iPhone 7, DVD to iPad Air 2, DVD to iMovie, DVD to iTunes, DVD to Kindle Fire, Surface, and any other videos playabled on Android Apple Google devices. And the latest version has already vanquished the latest (Disney) 99-title DVDs, as well as some other encrypted DVDs like workout DVD, Janpanese AV DVD and TV series DVDs. WinX DVD Ripper for Mac: Mac version HandBrake alternative for Mac users, with the same powerful ability as the Windows version. These HandBrake alternatives can auto analyze and select the correct DVD main title with full support for DVD CSS, region code, RCE, Sony ArccOS, UOPs, Disney X-project DRM, but for personal and family entertainment use only. How to choose right title of DVD with latest DVD copy protection - The lastest protected DVD by Disney, Paramount and Warner usually has 99 titles and the DVD movie size is larger than 40 GB. WinX DVD Ripper Platinum can perfectly remove such strong DVD Copy Protection. How to solve HandBrake No Title Found error - When I click on the source of the dvd i get an error saying "no titles found. please make sure you have selected a valid non copy protected source" What am i doing wrong? How to solve HandBrake No Valid Source Found error - There may be too many reasons for HandBrake No Valid Source Found Error: the input source file format may be not supported by HandBrake; your DVD source may be copy protected that cannot be removed by HandBrake unless some third-party codec like VLC is additionally utilized. How to Solve Handbrake Output Out of Order error - DVD producers create variety of DVD protections simply want to protect them from pirate and commercial use. Then when you trying to rip encrypted DVDs with Handbrake, you have huge chance to get Handbrake output out of order issue. 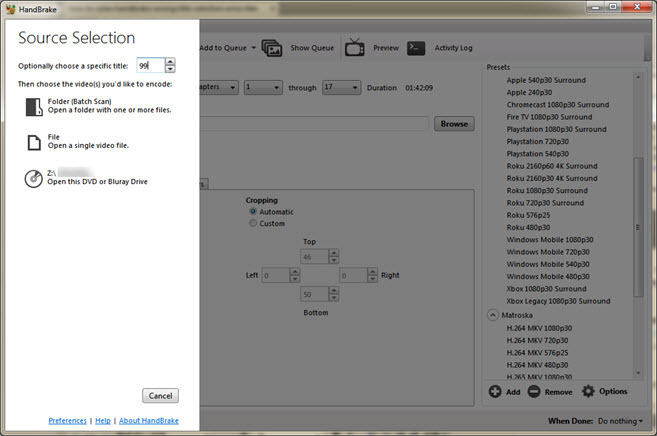 Want to learn details about how to make HandBrake select correct DVD title on PC/Mac, please Email us . Detailed guide on how to solve 'Can't rip DVD with Handbrake' problem on Windows 10/8/7, etc. If Handbrake still can't rip your DVDs, try some Handbrake alternatives for Windows (10) and Mac. Part1Why Can't HandBrake Choose Correct Title? How to Solve?